Our HDP5000 printer/encoder is feature-packed. Perfect for technology cards with embedded electronics, it reliably produces cards in High Definition with the highest image quality available. The HDP5000 upgrades easily with additional printing, laminating and encoding modules. Optional single-sided or simultaneous dual-sided lamination for higher card security–quickly. 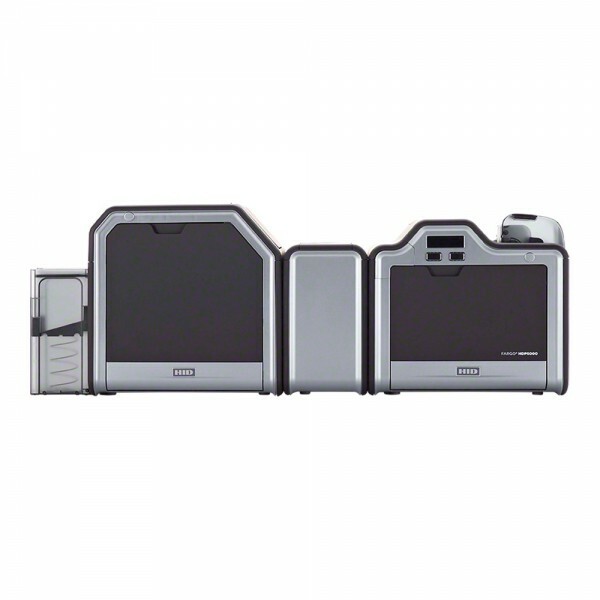 Dual-sided card printing option lets you double the print area available without manually reloading cards. SmartScreen™ LCD Control Panel displays helpful status messages and prompts. Cartridge-based card handling allows for both faster reloading and quicker switching to different card stocks. High yield ribbon, film and overlaminate cartridges load fast and eliminate the waste of torn materials from re-spooling. Encoding options include magnetic stripe, proximity, and contact and contactless smart cards. 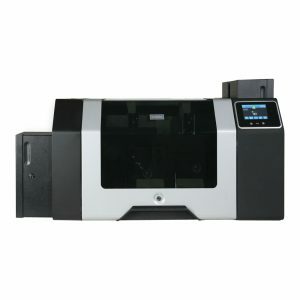 USB and Ethernet connectivity included, plus the HDP5000 includes an internal print server for secure network printing. Superior print quality, higher reliability and durability, greater security–your photo ID cards will have all these qualities when you print and encode them with the affordable and versatile HDP5000. High Definition Printing gives you superior print quality, even on cards with embedded electronics, for a more impressive public image. High reliability and durability lowers your total cost of ownership, and affordable pricing makes HDP Printing available to practically any business. We back the HDP5000 with a lifetime printhead warranty and two-year warranty on everything else. Versatile modular design permits change as your needs change. Dual-sided printing, single- or dual-sided lamination, and card encoding technologies are all field-upgradeable features. Minimal training is required because of its simple design and intuitive operation. Cards, ribbons, and overlaminates come in cartridges that load quickly and easily. Colours are vibrant. Images are crisp. Quality is second to none. With the Fargo HDP5000, ID cards do more than protect your organisation – they reflect its pride. HDP5000 produces ID cards with the highest image quality available. By printing a reverse image on the underside of HDP¨ Film, then fusing the film to the card surface, the HDP5000 creates an image quality that looks more like a sharp glossy photo than an ordinary ID badge. Printing on film instead of directly on the card means that the uneven surface of technology cards doesn’t compromise image quality. The HDP5000 can print up to the edge of smart chip contacts, and over-the-edge of the card. 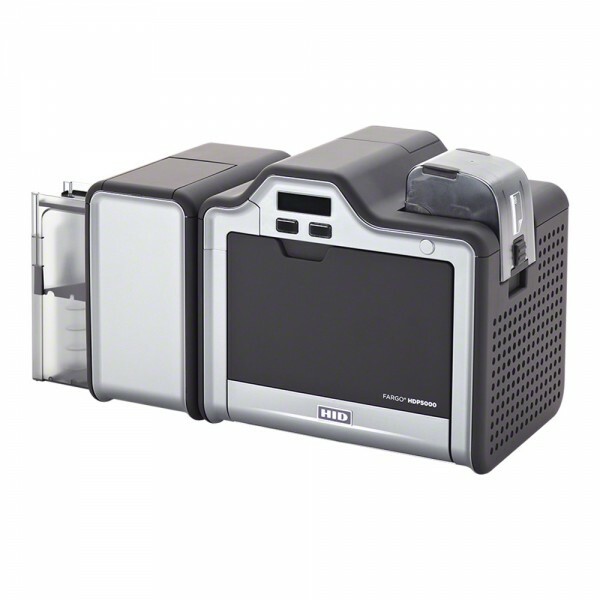 The HDP5000 is exceptionally reliable, which means less printer downtime. 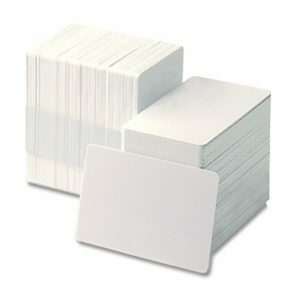 Because the printhead never comes in contact with card surfaces or debris, it’s never damaged in the printing process. In fact, it carries a lifetime warranty. Cards produced by High Definition Printing are inherently more durable and secure than other types of cards. They resist wear and tear by putting a durable layer of HDP Film between the card image and the outside world. They’re also tamperevident – if a counterfeiter tries to peel apart the layers, the image essentially destroys itself. Access control. Financial transactions. Biometric identification. Medical records management. Your ID card may hang at the end of a lanyard, but that’s not where its potential ends. Government agencies, large corporations and financial institutions are all tapping into the power of ID card technology, from proximity cards to multifunction smart cards. These card-based applications demand more capable, durable and secure ID cards than ever before. 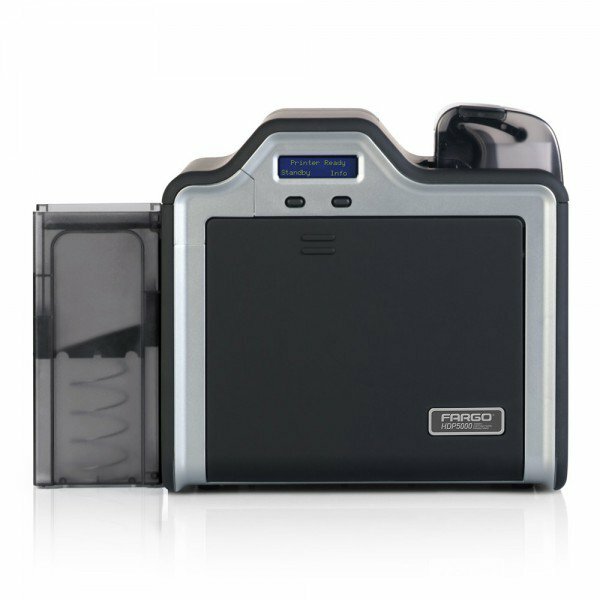 That means prox and smart cards produced in high definition by the Fargo HDP5000 High Definition Card Printer/Encoder. Fargo introduced High Definition Printing (HDP¨) technology in 1999, and we’ve been advancing the technology ever since. It produces High Definition cards that give you outstanding print quality over embedded electronics, plus high durability and security – the ideal way to produce prox and smart cards. The HDP5000 printer/encoder is our fastest, most efficient HDP model ever, with improvements at every level. Simpler operation requires only minimal training. 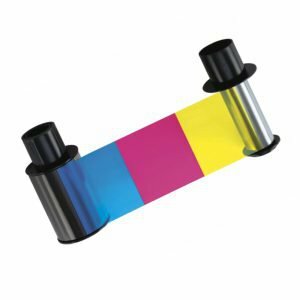 Cards, ribbons and overlaminates now come in cartridges that literally load in a snap. Sharper image quality and new HDP materials deliver more impressive cards at a lower cost per card. And faster printing helps you fly through the biggest production jobs. Applying a holographic overlaminate or holographic HDP Film to the front of an ID card improves its durability and security. An overlaminate on both sides doubles the protection. The HDP5000 laminates both sides of a card simultaneously in one efficient pass.Since the lamination module has no card flipper, it doesn’t waste time by turning a card over and laminating it again. Saving a few seconds per card may not sound like much. But multiplied by a 5,000- or 10,000-card production run, the savings are substantial. High Definition Printing is the latest technology for the best looking ID cards available, making the HDP5000 a smart choice for retail stores, recreation facilities, or any organization whose brand image is paramount. It’s also right for organizations that demand more functionality from their ID cards. Colleges, loyalty and membership programs, businesses and corporations, health care facilities and government agencies are all expanding their useof multifunction smart cards. Encoding options allow configuration of the HDP5000 to produce proximity and smart cards according to specific needs. And print quality is never sacrificed; the High Definition Printing process fuses the HDP Film to the card surface, conforming to ridges and indentations of the embedded electronics in smart and prox cards so images are always sharp. Card production is no longer limited to stand-alone badging stations. A retail chain, for example, can distribute card issuance over a network to any location. On a corporate campus or university, an array of printer/encoders can be set up in a central location for high-volume production. The HDP5000 is the ideal choice for countless scenarios. Its Ethernet port and internal print server provide the connectivity needed for networked operations. ISO 7816 Class A, AB and C card types. Including – HID Prox cards for the contactless interface and all ISO7816 compliant contact cards on the contact interface. * Indicates the ribbon type and the number of ribbon panels printed where Y=Yellow, M=Magenta, C=Cyan, K=Resin Black, I=Inhibit, F=Fluorescing, H=Heat Seal. ** Print speed indicates an approximate print speed and is measured from the time a card drops into the output hopper to the time the next card drops into the output hopper. Print speeds do not include encoding time or the time needed for the PC to process the image. Process time is dependent on the size of the file, the CPU, amount of RAM and the amount of available resources at the time of the print.